We all know we should pay our bills on time. But it’s so easy to spend the money on other things or even just forget! And what could a few days late really mean? A lot, it turns out. Did you know that your payment history accounts for 35 percent of your credit score, according to one estimate? Late payments can really damage your credit score, which in turn can make it hard to get credit or a good interest rate, or potentially even to rent an apartment that you want! So it pays to stay on top of those bills. Like many people, do you toss your bills in a pile for later review? Without a system in place for managing bills, they’re likely to get lost or forgotten. So the first step is putting your bills in one safe, convenient place where you won’t forget them. Paper bills should go in a box or basket or even a file folder. E-bills should go in a folder on your desktop where you’ll be sure to see them. Your bills arrive like clockwork, so make sure you pay them like clockwork, too. Maybe that means you set aside an hour on the 1st and the 15th of every month, or a day right after payday. Whatever schedule works for you, write it down on your calendar or use an app to send you a reminder. You can also create a monthly bills checklist where you list every bill and check it off once it’s paid. Adjust your due dates to fit your schedule. Did you know that many accounts, particularly credit cards, let you choose your own due date? 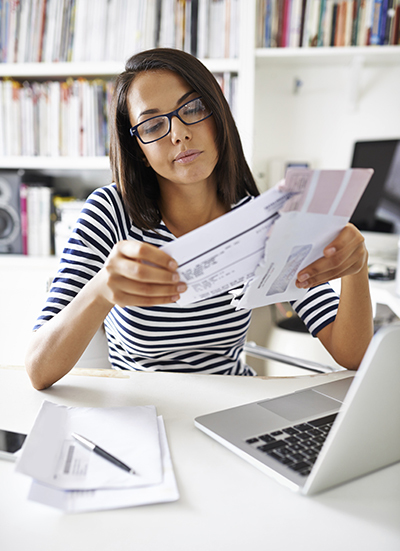 Depending on your situation, it might be helpful to have all your bills due on the same day. Or you might prefer to space them out so you don’t run out of money. Do whatever works best for you. Paying bills is never fun, but it’s a whole lot easier online. Online bill payment means no more hassling with checks and stamps—and no paper cuts! These days, you can have almost every bill delivered via email or even text. And every one can be paid using your bank’s free online bill pay service. You can also pay bills at many creditors’ websites. For example, you can quickly and easily pay your Conn’s HomePlus® bill at conns.com/pay_your_bill. There’s no fee to use the service and you can have your payment transferred from your checking or savings account. For monthly bills that are always the same amount like a mortgage, car payment or retail installment contract, you can schedule monthly payments through your bank’s online bill pay or at the creditor’s website. Conn’s HomePlus lets you set up automatic payments and choose the date the payment will be made.